We recently decided we need more images of the Solite with people in the shot - we have lots of product photos of the bed on its own, but very few of the bed in use. 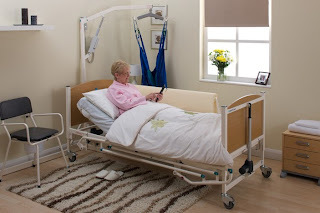 The issue is very similar to when we needed photos of the Innov8 hospital bed in use. We could hardly go onto a hospital ward to take photos with real patients, so we went to a photographer’s studio and mocked up a hospital ward. We did the same thing for the new Solite shots. We chose a studio in Elland where a ‘bedroom’ was constructed and, with the help of Kim Robinson’s Gran (Lynn’s Mum), took loads of photos of the Solite Laser 4 with lots of difference accessories. You can see the finished photo of the Solite below, and underneath that a broader shot showing how it was done.